Special note on the library vi's: Starting in 2013 the cRIO simulator was added. This introduced two different versions of many of the WPILib vi's, one for executing stand-alone on a PC and another for standard operation on the robot cRIO. The proper version of the library code gets loaded depending on the current Target (PC vs. cRIO). An odd side effect of this is that if you drop a library vi onto a blank vi just to drill down to study the internals, then you will probably get the PC version and you'll be studying how the cRIO simulator works, not how the robot version of the code works. Here are examples of ways to do some of the most common robot functions. Because the framework spreads the required elements over several files these examples are in image form to get all the parts together where you can see everything in one glance. Each example includes the menu paths to where all the icons used within that image are found. 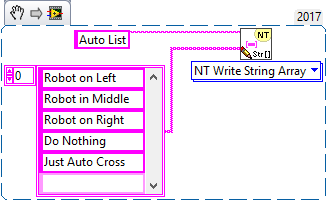 LabVIEW also provides stand-alone ready-to-execute examples from the Getting Started Window that include wiring diagrams for connecting devices properly. Those sample projects are great for testing if a device is working and wired correctly. 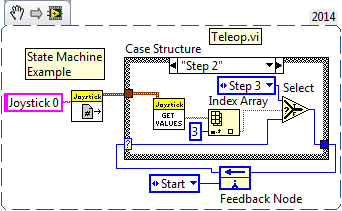 Since they are stand-alone programs it takes some intermediate understanding of the default framework to figure out how to properly integrate the concepts into your LabVIEW project. 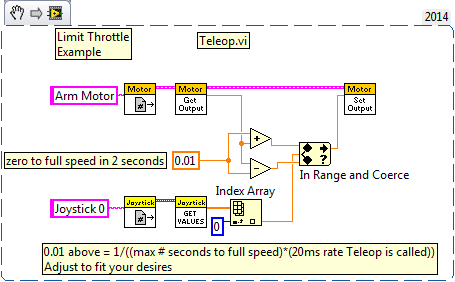 If the Nidec DIO connection comes loose, then the motor will race uncontrollably while the robot is Enabled. Here is an example of how to minimize that potential problem. The motor is Disabled when neutral (whenever it is not actively being commanded to move). Button Start of Timed Action (2015) - the timed-delays used here as an example can be replaced with sensors that tell positively when the mechanism is cocked or has finished shooting. Which Button Was Pushed (2015) - Useful for deciding which of several joystick or custom Driver Station buttons was pushed. This acts based on which of an array of buttons was pushed. Lowest number button wins if several are pushed at once. This one lets button presses choose between named Cases. Button Increment Power (2015) - This raises or lowers the power to a motor whenever one of the buttons is pushed, so it increments the power one step with each push. POV (Point of View or Hat control) (2017) - The POV or Hat switch is a common control switch on game controllers. It's handled in an unusual way, because it is a 360 degree button that sends the directional angle it is pressed (in 45 degree increments). Servos & solenoids are only used here by way of example. Switch (2015) - has a toggle for selecting Normally-Closed or Normally-Open wiring. Has a counter mode that counts the number of times the switch is activated. Clear PCM/PDP Sticky Faults (2018) - This example uses the roboRIO User button to clear PCM and PDP sticky faults (changes the PDP/PCM status lights from yellow to green-until the next sticky fault occurs). A good place for this is in Periodic Tasks in the 100ms loop. 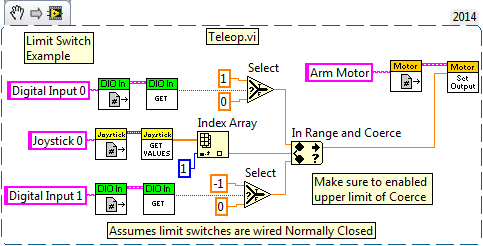 Limit Throttle (2015) - this example works ONLY in Teleop.vi because it depends on the regular 50Hz rate at which Teleop.vi gets called. To use it in Periodic Tasks, for instance, it would be called inside a loop and a loop delay would be added. Variant to ramp up the speed of Drive motors. Joystick Deadband (2015) - How to deal with a sloppy joystick that doesn't quite return to zero when released. The first example has the same deadband, but truncates the motor output delivering between .1 and 1 (or -.1 and -1), so no .05 power ever shows up. This is good for devices, such as drivetrains, that won't move with less than .3 power anyway. It gives the joystick a little more range. 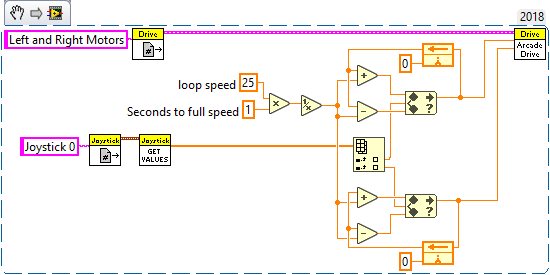 In the second example the joystick is ignored within the deadband (.1 to -.1 in this example) and outside that band delivers motor power from 0 to 1. Joystick Max Throttle Limit (2015) - How to deal with a drive train that's too fast (well if you can't gear it down). The first example uses the throttle on an Extreme 3D joystick as a variable control to limit max driving power to between 50-100%. A possible variation might be to allow more power to the Arcade rotate input. In the second example the max power is limited to a hardcoded 80%. To be able to vary the range (e.g., 20-100%) uses a different equation to remap (-1 to 1) into (.2 to 1.0) and is probably easiest to implement with a Formula Node from the Programming->Structures palette. Then (x+1)/2*y+(1-y) produces the range .2 to 1.0 from the throttle axis. Tachometer (2015) - assumes a digital sensor, such as a retro-reflective light sensor, is used to detect a spinning object. One caution about Counter - it can produce scrambled or bogus values on startup, so be careful and examine the results when you first put it to use. Encoder (2015) Only allows for four encoders to be sampled at 4x, but many at 2X. Moving Average (2015) - You call this subvi to add a new value with each call and it produces the average over a window of the last n samples. You tell it the number of values (n) to average only with the first call, thereafter, that input is ignored. It also lets you know when you have reached a full set of values. This example illustrates initialization, sequencing to avoid clobbering values as you use them, safeguarding from changing inputs that cannot be changed, array manipulation, and creating a cycling index. 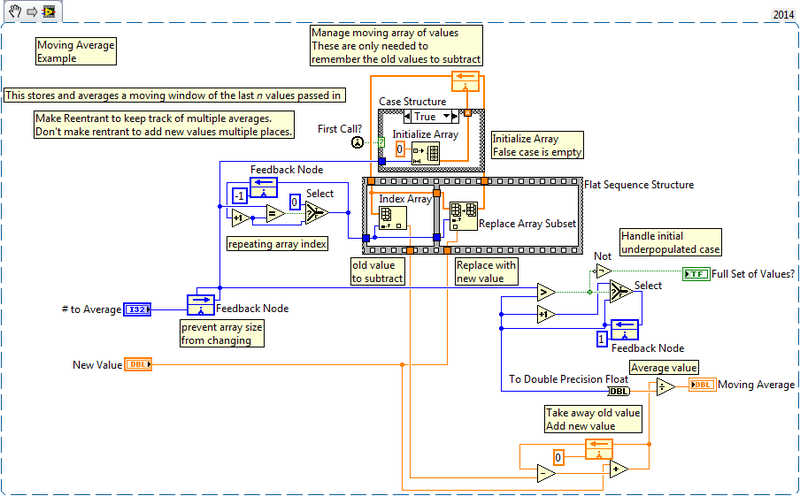 LabVIEW has quite a few built-in filters that do the work for you located in the Functions pallete under Signal Processing->Filters. State Machine (2015) - the idea here is that you want to do different things based on a particular state your program is tracking. In this example you'd add some kind of activities for each state, such as activating solenoids or motors. States might change based on sensor feedback, such as a ball sensor. Delayed Event (2015) - this is for use within iterative vi's, such as Teleop, and simply might start an action, then stop it n seconds later. This type of action can also be performed for you by the Elapsed Time vi. P(ID) Example (2015)- This code slaves a pot on the robot to the x-axis of a joystick via Proportional feedback. No I or D terms are used. Most of the work here is just the part that maps the full range of joystick movement to the steering motor potentiometer (pot) sensor. The PID part is pretty simple. The harder part is tuning the P coefficient by experimenting with the real robot. Interrupt (2015) Use of this will be rare, but this can be used with either a Digital Input or an Analog Trigger. The formula node allows for the insertion of a pretty good subset of C. It not only lets you write equations, but loops and conditional code as well. 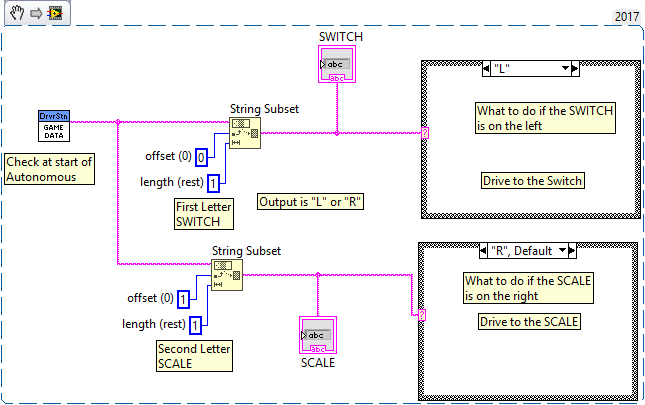 To call C functions from LabVIEW you can create a C source library, then call into that library using a Call Library Function. For simple code use the formula node mentioned just above. The formula node allows for the insertion of a pretty good subset of C. It not only lets you write equations, but loops and conditional code as well. 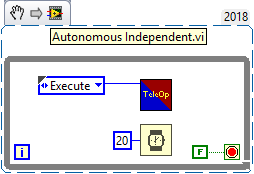 Autonomous Independent.vi can be multiple parallel tasks. For example, the following two samples can co-exist quite comfortably in the same vi. 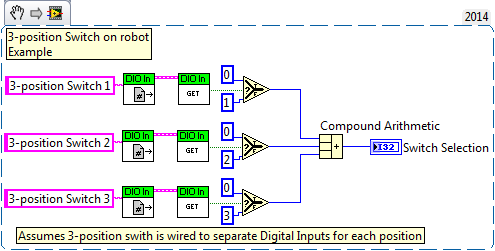 Two independent sequences operating at the same time, one driving the robot while the other blinks a solenoid status light. This case is quite simple, however, it illustrates that much more complicated parallel independent tasking such as this is possible. Maybe a robot juggling while navigating a maze. Run Teleop During Autonomous - In 2019 the game has the drivers driving during the Sandstorm (formerly Autonomous) period. This goes in Autonomous Independent.vi to call the regular Teleop.vi and provide normal control during that 15 second game period. 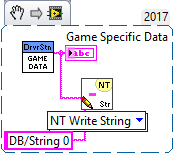 Game Data - this just parses the 2018 FMS Game Data so the code can make decisions based on the characters received. This type of code would be used in the Autonomous vi, but would require more logic to tell it the robot starting position and have decision logc that decides what to do. Here's an example that uses the Auto Selection in Begin.vi & on the default Dashboard to select robot start position and what auto you want to run. Here is a snippet that echos the GameData received back to the Default Dashboard on the Basic tab. This gets placed in the Periodic Tasks 100ms loop.